What’s behind the rise in problem pimples? Although we tend to associate acne with the angst-ridden adolescent years, in actuality many of the factors that contribute to teenage acne are still at play in older women’s lives. In particular, stress and hormonal fluctuations can wreak havoc on our skin – and many women these days do experience that magical combination of hormonal changes and lifestyle stress. The relationship between stress and breakouts can quickly become a vicious cycle. When our bodies feel stress, our adrenal glands respond by producing more of the stress hormone cortisol, as well as small amounts of testosterone. These cause the oil glands in the skin to produce more sebum, which can raise the risk of skin infections and pimples. Of course, when we notice pimples appearing, we feel more stress. Add to that the fact that many of us can’t resist the temptation to pick and spread any bacteria present, and you have the formula for ongoing acne outbreaks. Finding a solution for adult acne can feel like a quest for the impossible. Consider this: Acne costs Americans an astounding $15 billion a year in related products and services. Perhaps ironically, we seem to be surrounded by skin care marketing that promises to clear up all skin issues and restore a flawless, youthful glow. But many of these products can actually worsen inflammation. It all adds up to frustration. It’s no wonder that 95 percent of people with acne say the skin condition has affected their lives, with 63 percent citing lower self-confidence. How can you treat adult acne? The simple truth is that treatment has to start from within. Instead of seeking a “magic bullet” skin cream, it’s often best to start with a bit of self-reflection. For example, try tracking outbreaks to see if they coincide with your hormonal cycle, with other symptoms, with specific foods, or with stressful periods in your life. Treating adult acne at the root cause can help you deal with this often-frustrating issue in a more permanent way, and often the more stubborn cases come down to a hormonal imbalance. Whether you’re in your 20’s or firmly in perimenopause, working with an Integrative medical practitioner or Naturopath can help you look at your full hormonal picture, and find the right plan to bring your hormones, and your skin, back in balance. Both elevated estrogens before periods and too much testosterone dosed before or after menopause can cause acne. If you are getting hormone replacement therapy, and develop acne, there is probably too much testosterone being dosed. Dr. Morstein has expertise in dosing BioIdentical Hormones. She is a frequent lecturer on BHRT at medical conferences. Think of ways you can reduce the stressors around you. Yoga and meditation have been proven to reduce stress, and ayurvedic tradition holds that many yoga poses can help with acne. In addition, don’t forget one of the most essential parts of stress management: adequate sleep! (To keep your skin extra fresh while you sleep, make sure your pillow cases are always clean). Much research remains to be done on the impact of diet on acne, but it’s been confirmed that the quality of the food we eat is reflected in our skin. Ultimately, you’re the best test study for which foods affect your complexion, since people can react differently to various foods. Keeping a food diary and reviewing it with your healthcare practitioner is a good starting point. Oftentimes, doing a food sensitivity test can find foods that specifically react to your body. A sensible approach is to eat a healthy, whole-foods based diet, opting for antioxidant-rich foods whenever possible. Antioxidants can reduce inflammation and destroy harmful free radicals. Some problematic foods associated with acne include dairy, chocolate, and caffeine. Zinc: The anti-inflammatory properties of zinc can help relieve the irritation of acne. Some research shows that taking a zinc supplement can even reduce acne scars. Zinc can also be applied topically, but it usually won’t be as effective. When it comes to your diet, zinc rich foods include beef and shellfish, especially oysters, and vegetarian sources like hemp seeds, pumpkin seeds, beans, nuts, and whole grains. High fiber foods. Eating food with a lot of fiber can help control your blood sugar by slowing down sugar absorption and keeping you fuller longer. This helps to curb acne breakouts since healthy blood sugar levels can influence cortisol production. Aim for plenty of green veggies with each meal! Stay Hydrated. You may have noticed that your skin loses some luster when you’re dehydrated – It’s important to drink plenty of water to keep your skin cells healthy and nourished. Green Tea. In addition to water, don’t hesitate to pour yourself a cup of green tea. Studies show green tea can decrease sebum production. Plus, this delicious beverage is high in antioxidants! A more natural approach to moisturizing and nourishing your skin may be helpful, as many people react to the chemicals, perfumes and preservatives in skin creams. Natural oils such as Jojoba, which has similar properties to the sebum produced by your skin, may work better to keep your oiliness in check than the drying benzoate creams of your youth. However be cautious when adding essential oils to your regimen as some can be a little harsh on sensitive skin. Talk to your healthcare provider for guidance if you are having difficulty finding the right skincare solution. A number of effective remedies are available, but you want to make sure to pick a treatment that works for your particular skin. Adult Acne Can Be Treated Naturally! What worked in high school for clearing up your pimples might not be as effective as an adult, because as we get older the reasons for breakouts change. So if you see pimples developing, remain calm and take a focused look at the lifestyle factors that could be contributing. If you have done what you can and are ready for professional analysis and guidance on skin-friendly treatments, come into the office! Together we can look at your diet, hormones Treating adult acne at the root cause can help you deal with this often-frustrating issue in a more permanent way, and often the more stubborn cases come down to a hormonal imbalance. Whether you’re in your 20’s or firmly in perimenopause, working with an Integrative medical practitioner or Naturopath can help you look at your full hormonal picture, and find the right plan to bring your hormones and your skin back in balance. 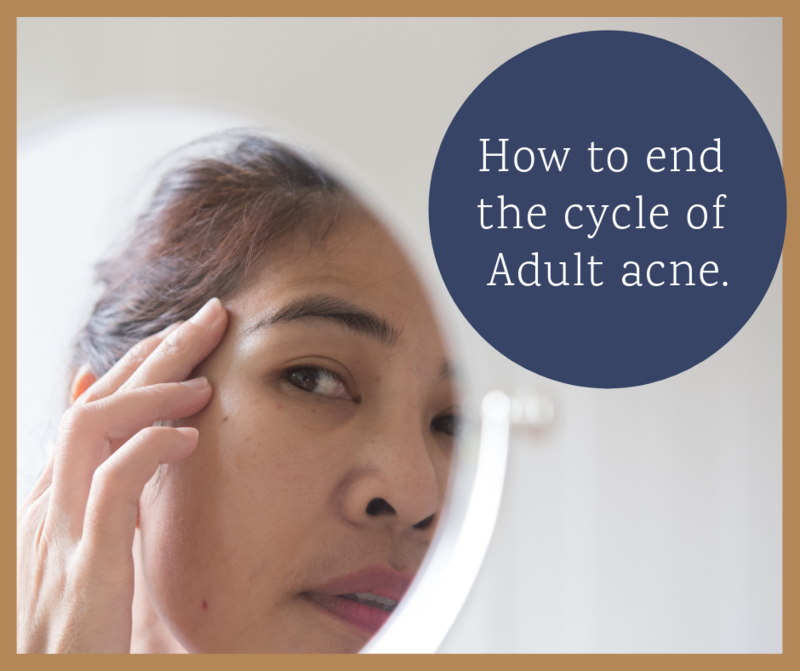 Adult acne doesn’t have to be frustrating.